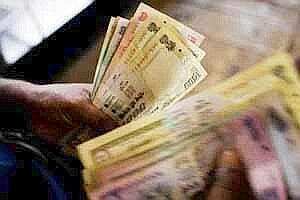 Mumbai: The rupee gained in afternoon trade on Thursday on account of dollar selling from corporates and hopes that steps announced by the central bank could boost dollar inflows and help rupee stand its ground. Traders said the central bank is likely to have intervened earlier in the day, for a second consecutive day, strengthening the view that future fall in the rupee may be limited and sparked the dollar sales. In the absence of any support from the central bank, exporters and corporates may have held on to the dollars eyeing better levels, they said. On Wednesday, the central bank eased rules on overseas borrowing by firms and raised the ceiling on interest rates for deposits by non-resident Indians. At 2:18pm, the partially convertible rupee was at 52.14/15 per dollar, stronger than Wednesday’s close of 52.36/37. It had skidded to an all-time low of 52.73 on Tuesday. Any further improvement in the rupee may however be limited on fears that the Europe’s debt crisis may be worsening. The euro stayed near seven-week lows against the dollar on Thursday, having suffered a steep fall after a “disastrous" German bond sale fuelled fears the region’s debt crisis was beginning to threaten even Europe’s biggest economy.